Built-in web browser to visit YouTube.com directly and watch videos easily. 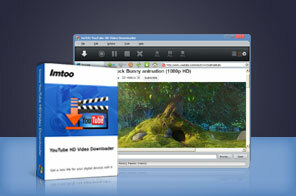 Make a selection on resolutions to decide downloading YouTube HD or SD videos. Thumbnail view on downloading file list, you can have a more straightforward preview of downloaded videos. Automatically start previous unfinished tasks after launching the application. Auto-exit the application, shut down, hibernate, stand by the computer, or do nothing after the YouTube HD downloading tasks are done.